I am still angry about the debacle over the Equality Bill last week when the Government decided that, actually, you know equality in exams and qualifications for disabled people, isn’t all that important, like. So angry, that I have created a No.10 Downing Street petition to vent my anger. If you’re angry too, please add your name as soon as you can to the petition. And tell your friends, families, random acquaintances, pets, etc. The more people who sign it, the more the Government will realise that they cannot, in the 21st century, get away with denying full access to GCSEs, A Levels and other general qualifications for deaf and other disabled people. I’m off to find a barracade to chain myself to. PS The Downing Street website will send you an email to check that you want to sign the petition – so please check your email afterwards! I thought the Government had a goal of equality for disabled people by 2025 but, when it comes to exams, it turns out that just “minimising disadvantage” is the highest goal the Government will aspire to. Yes, I’ve slipped back into angry deaf man mode. On Tuesday, Lords were debating the issue of accessible exams for disabled people and possible new laws as part of the Equality Bill. NDCS, Skill, Afasic, RNIB, the Disability Charities Consortium and the Equality and Human Rights Commission all wanted the Government to strengthen the law. But the Government decided to side with the views of exam bodies. The same people who removed all support for disabled people in 2005 on the basis that reasonable adjustments were unfair and took marks away from deaf students when they were unable to hear tapes in oral exams. If a deaf person wanted a test on ability to hear, I think most of us would prefer to go to an audiologist. Anyhow, NDCS led a coaition to get that support reinstated but still, we come across sporadic examples of problems. Anecdotally, my colleagues report still going to meetings where exam bodies discuss whether someone reading out text for blind people is “unfair” to non-blind people. The Equality Bill now provides exam bodies and the exams regulator with a range of “get-out” clauses to avoid having to provide full access, even though there are lots of safeguards already in place to make sure that the exams are still rigorous and not watered down. Perhaps the most offensive thing of all is that the Bill says the regulator only needs to “minimise” disadvantage faced by disabled people in exams. If you’re going to be slapped around the face unnecessarily, it’s not much consolation to be told that the Government did try to “minimise” any harm to you. You can read NDCS’s statement on this issue here. We’re having a think about next steps. If you’ve got any thoughts on the issue or any ideas on next steps, please do leave a comment below or email NDCS at campaigns@ndcs.org.uk. If you’re wondering what the Lords were doing on the 15th day of December, they were having a big debate on equality. Maybe leaping around as well. The Equality Bill had its first debate in the House of Lords last week, just before Parliament closed down for Christmas. The Equality Bill is an important bonzer Bill, aiming to streamline all of the existing pieces of legislation on discrimination into a single piece of legislation. As Michael Jackson might have put it if he was still alive, it doesn’t matter if you’re black or white, disabled, lesbian, Hindu, polysexual, anything. The Equality Bill will sort you out. But in seriousness, it’s a serious Bill that the big disabled charties are welcoming, as a “critical friend”. NDCS‘s main interest in the Bill is in what it says about access to examinations for disabled students. This is an area in which the exam bodies have very bad form. Halfway through the noughties, exam bodies withdrew all support for disabled students in a bizarre misreading of disability discrimination law. NDCS successfully campaigned for that support to be reinstated but there are still concerns that some of the exam bodies still just don’t get it. Disabled students have the right to be able to demonstrate what they can do through a system of flexibly designed exams. It cannot be impossible to do this without undermining the value of the qualification. The Government has been listening to our concerns and is proposing that the new exams regulator, Ofqual, will have the power to decide what exam bodies should and shouldn’t do when considering how disabled people can access exams. This is a nice idea in principle, but it does give Ofqual a lot of power. So NDCS is working with a range of other charities to make sure there are checks in place to make sure this power is used for the benefit of disabled people. We’re looking to get the wording of the legislation changed. For example, currently, it says it would be “desirable” for Ofqual to try and “minimise” the disadvantage to disabled students. I don’t like the word “minimise”; it seems to assume that an outcome in which some disadvantage is present is tolerable or acceptable. We want the exam system to work to eliminate disadvantage. And “desirable”? It sounds as if access to examinations is something I might find on an Amazon wish list. The Bill is going to be debated again in January, and we’ll looking to get the wording of the Bill changed to something that gives full access for deaf students in exams. Hopefully, it will be our first campaign victory of 2010. This is going to be my last blog before Christmas – so seasons greetings to everyone and thanks for reading and commenting! She may not been the musical theme on the X Factor (though it was fun to see John and Edward clarify that they were performing the hits of Queen, the group, and not Her Majesty), but the Queen had her annual fun day out last week on the 18th, when she paid a trip to the Houses of Parliament to read out the Government’s plans for the year ahead. Or rather for the 70 days left of parliamentary business before the next general election. Two bills of interest to NDCS. 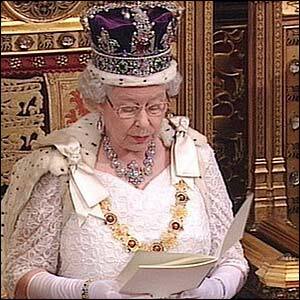 Firstly, the Equality Bill. This is in fact a ‘carry over’ Bill from the last parliamentary year so NDCS will be carrying over our lobbying work on access to examinations for disabled young people. The second bill is a new one, the Children, Schools and Families Bill. It contains a whole range of new proposals on education including on teacher training, curriculum, Ofsted and safeguarding. But one the proposals that is getting a lot of attention is the pupil guarantee, for children to have various entitlements to PE, one to one support, etc. Although it has its critics, I personally think it’s could be an interesting idea. We know that deaf children experience variations in the quality of provision they receive across England. If was drafted in a favourable way, could the new guarantee help ensure that all deaf children get a minimum standard of provision, with nobody left behind? NDCS will be taking a close look at the Bill to see what opportunities it presents to improve education for deaf children. In the meantime, any thoughts on the Bills? Anything in particular NDCS should be lobbying on? It’s the time of year again when lots of expectant young people find out how they did in their A Level and GCSE exams. So we thought it would be a good idea to remind the media about how the exam system is stacked against deaf children. Legislation requires disabled candidates to be given the necessary support they need during exams. Yet we repeatedly get emails from parents with horror stories about their deaf child being unable to access an exam. Examples include transcripts of audio and video tapes not being provided on time, deaf children being asked questions in English about music and being asked to remove hearing aids in case they whistled during the exam (despite the fact this would cause tinnutis for the affected child). If deaf students can’t access exams, then they’ll be less likely to get the qualifications they need for a good job that reflects their abilities. There are no excuses for not getting it right. 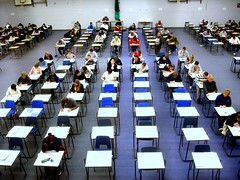 Exam bodies have very bad form on access to exams. Our bad beef began back in 2005 when the regulator suddenly decided to withdraw all support available to disabled candidates, apparently on the basis that this was unfair to non-disabled candidates. It was around two years, after a big campaign led by NDCS, before this support was reinstated. Since then, exam bodies have continued to grumble. They still don’t seem to really grasp their responsibility to design exams in a way that disabled candidates are able to demonstrate their abilities. We think a fundamental overhaul is needed and, when Parliament returns, we’re going to be doing some lobbying work on the Equality Bill to try and drag exam bodies into the 21st century.